Katie Ruxton has been a steward at the Registry of Motor Vehicles office in Taunton for a little over a year, but she’s making a big impact. When she noticed how much people liked the “team” jackets employees there had purchased, she encouraged her fellow members to order more for new hires and expand their team wardrobe. Now the team gear, and their great teamwork, are generating compliments. Ruxton, a Taunton native, was studying criminal justice at Bristol Community College five years ago when a job opened up at the RMV. She decided to take it and discovered she liked working there, helping the public. “She’s smart, she’s enthusiastic, she gets along with her coworkers very well, and she has a tremendous drive to help people. I’m lucky she took a job at one of my agencies,” joked Mann. When Ruxton transferred to Taunton, she found a group of coworkers already working as a close-knit team, and she was pleased to fit right in. “I’ve never had a bond like we had there. It’s like a second family.” She said that management and NAGE members have worked well together to keep things at the Taunton RMV office working smoothly. The Taunton RMV employees get a lot of kudos for their customer service, too. “Customers have a right to expect excellent customer service from the Registry. It also important for our team to know when the service they provide makes a difference, like the customers who have written to let us know that they consider members of the Taunton team to be ‘fantastic,’ ‘extremely patient,’ ‘courteous, upbeat, efficient and …capable multi-tasker[s].’ The service that the RMV provides matters to our customers, which is why our team members are important to the RMV,” said Registrar Erin Deveney. Ruxton noticed that several coworkers in Taunton had jackets with matching RMV logos. A coworker had purchased them for the team members a few years back as gifts. Ruxton also noticed how many compliments the jackets generated among Registry customers. She thought: What if we did more of this? 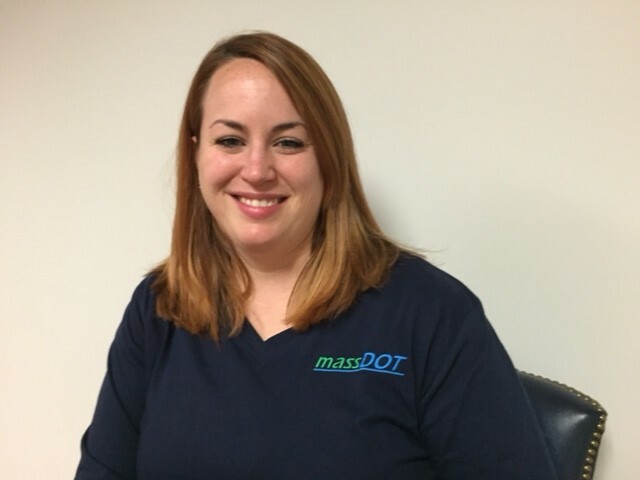 So Ruxton talked it over with her coworkers and ordered some shirts with the new MassDOT logo on them. She and her coworkers wore them, and customer compliments increased again. They’re expanding their team wardrobe to include a variety of shirts and jackets in 2016.